Gather Statistics. Analyze Trends. Assess Services. Organize and Consolidate All Library Statistics in One Place to Run Cross-Dataset Analysis and Make Data-driven Decisions. 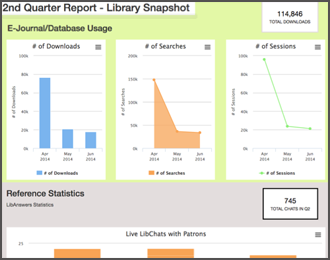 LibInsight is an effective tool for collaborative recording and analysis of library statistics and data points. Store all library data in one platform, and use cross-dataset analytics to frame data-driven decision making. A variety of built-in dataset types can be further customized for the specific data-gathering needs of your library. Get the full picture of usage and effectiveness of your eBooks, E-Journals, and Database subscriptions. COUNTER & SUSHI Support. Upload COUNTER reports or harvest directly from vendors. Cost Analysis. 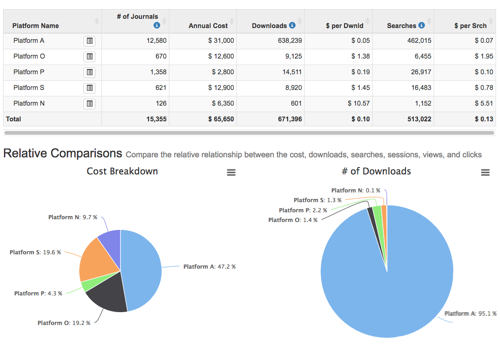 View total costs, cost-per-download, etc. Usage Analysis. Observe e-resource usage with total downloads, searches, and sessions. Duplicates. Get info on journal/eBook duplicates across platforms. Most/Least Used. See most popular and least-used journals and eBooks across all platforms. Slice and dice your Circulation and Acquisitions data to get the full picture of your purchases and how they circulate. Granular, Time-Based Reports. View usage and purchase trends from monthly, daily, down to hourly. Customizable Groups. Import your unique ILS data and create custom report filters (patron type, location, etc.). By Classification. View purchases & checkouts by classification to see if you’re buying what’s circulating. Multi-Year Trend Analysis. Gain historical insights with year-over-year trend reporting. What’s Popular. View the top 100 circulated items and gain insight as to what’s trending in the library. Enter financial data and expenditures and analyze trends like a financial pro. Expenditures and Revenues. Create customized categories for all budget items and track the figures over time. Multi Year Trends. With historical data in the system, analyzing multi-year financial trends is a breeze. Individual Line Items Get down to nitty gritty details of each line item and track changes over time. Customizable Finance Reports. Create customized reports for the administration showing relevant financial indicators. Bang For Your Buck. 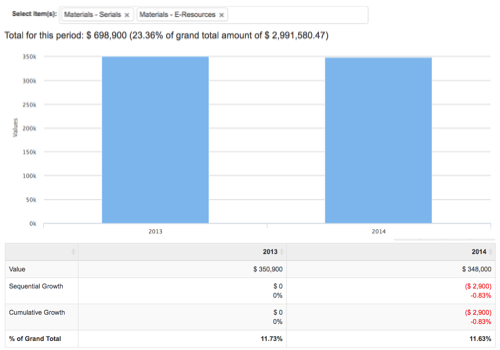 Compare Financial and Circulation datasets to see how your materials budgets perform. Get a complete picture of your library's foot traffic. Use the Gate Count info in combination with other Datasets to analyze the relationship between the "virtual" and "physical" library services. One, or More Libraries. Track gate counts for a single location or for multiple libraries/locations. Hourly/Daily/Monthly Distribution. Gather data at various frequencies and compare hourly to monthly (or even yearly) traffic distributions. Multi Year Trends With historical data in the system, analyzing multi-year traffic trends is a breeze. 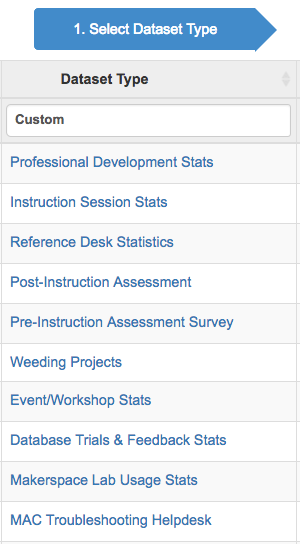 Top 10 Periods Create reports showing top 10 busiest periods or locations for your library. We are adding new Dataset Types in LibInsight all the time so let us know your ideas for adding more. Below is the list of current dataset types. Each of these can be customized further for your specific needs. Create custom datasets for your own unique data-gathering needs. LibInsight can handle any number of fields and field types, form layouts, report variations, etc. Custom Datasets enable you to define specific fields and data points relevant to your library's statistics scenarios. Define any number of fields to be tracked: text fields, numeric, multiple choice, dates, scales, etc. Create calculations from 1 or more numeric or monetary fields, too. Decide who can administer datasets, who can enter data, and who can run reports. LibInsight's finely-tuned user permissions ensure data integrity and security. LibInsight enables manual recording of transactions via forms and mobile devices. Or, import data from spreadsheets and combine with existing data in the system. Filter, slice, dice, and report on data inside each Dataset. The point-and-click filtering and reports builder help you navigate your custom datasets in a visual way. 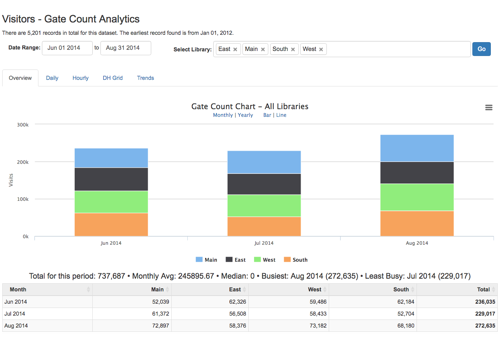 Create Dashboards and publish them online, allowing you to communicate valuable library statistics to your community. Dashboards contain customized charts and time ranges and are continually updated. The Dashboards builder is point-and-click and no programming or statistics knowledge is required to create and publish dashboards. Create as many public dashboards as you need, for whatever task/project - the only requirement is that the underlying data lives in LibInsight. How does circulation compare to gate counts? Do spikes in website traffic correlate to E-Resource downloads? Is there a relationship between instruction sessions and number of research appointments held? How does an increase in Room Reservations and Equipment Booking correlate to Gate Counts? Cross-dataset analytics help with effective assessment and evaluation of library services. Make a stronger case for your library services by pulling information from previously siloed data. Students, faculty, administrators, and the library staff rave about LibGuides, LibCal, LibAnswers, and LibInsight. Why? Because access to the library resources and library instruction has never been easier. Collect and share data with libraries in your consortium, state, regional/national group, or with the entire LibInsight community… right from within your system. Shared Datasets in LibInsight enable data gathering and collaboration across any number of institutions. It's a great way for a group of institutions to collaborate and create unified data collection points and then run analysis to compare data and usage. Create a Shared Dataset in your LibInsight system and define relevant fields that everyone in the group will share. Select which other LibInsight systems should have access to record data and run analysis on this Dataset you created. All institutions in the Group can record individual transactions and then run reports on the accumulated shared data. Get started with creating Custom Datasets and Interactive Dashboards with LibInsight Lite. LibInsight Lite is a "lite" version of the full LibInsight system. 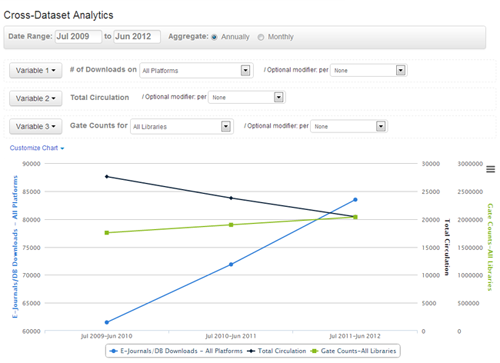 As your analytics needs grow, you can easily update to the full LibInsight platform. 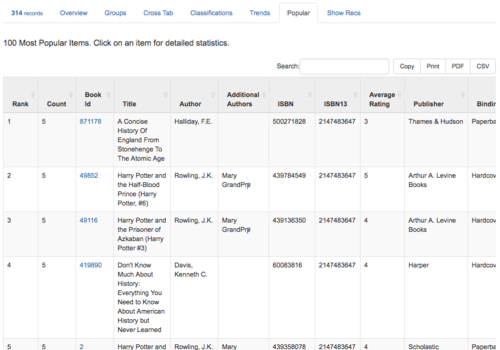 An important component of the Springshare Platform, LibInsight provides comprehensive data analysis tools that surface the real value and the real impact of the work librarians do day in and day out.